Comm Eye Health Vol. 12 No. 32 1999 pp 53 - 54. Published online 01 December 1999. 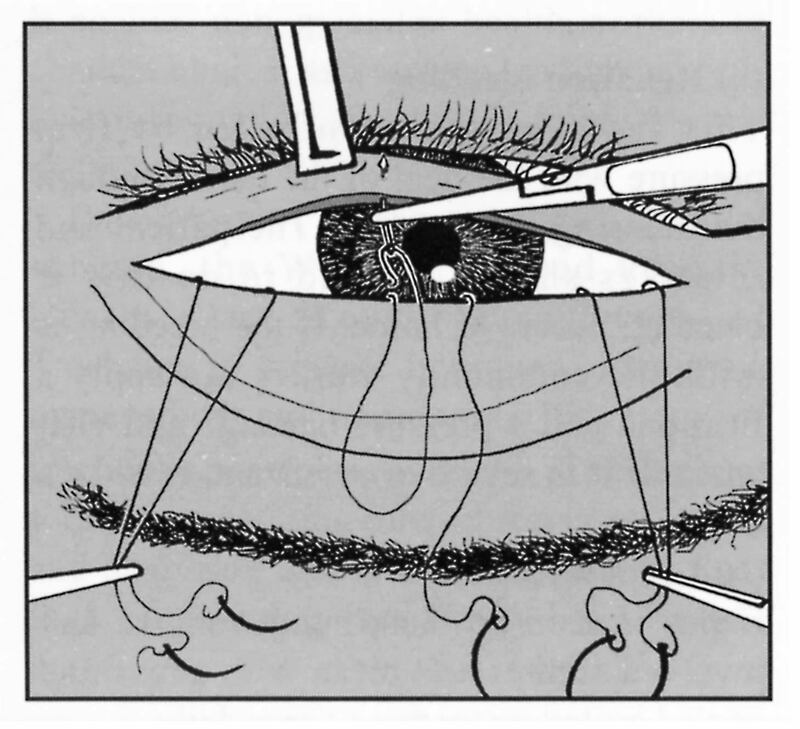 Trichiasis involves eyelashes rubbing on the eyeball. Repeated infection with Chlamydia Trachomatis causes scarring and shrinking of the conjunctiva lining the inside of the eyelid (tarsal conjunctiva), which has the effect of pulling the lid margin towards the eye (entropion) and with it the lashes. If the lashes are in prolonged contact with the cornea, then permanent corneal scarring and visual impairment may result. In addition, since the cornea is one of the most sensitive parts of the body, trichiasis can be a very painful condition. 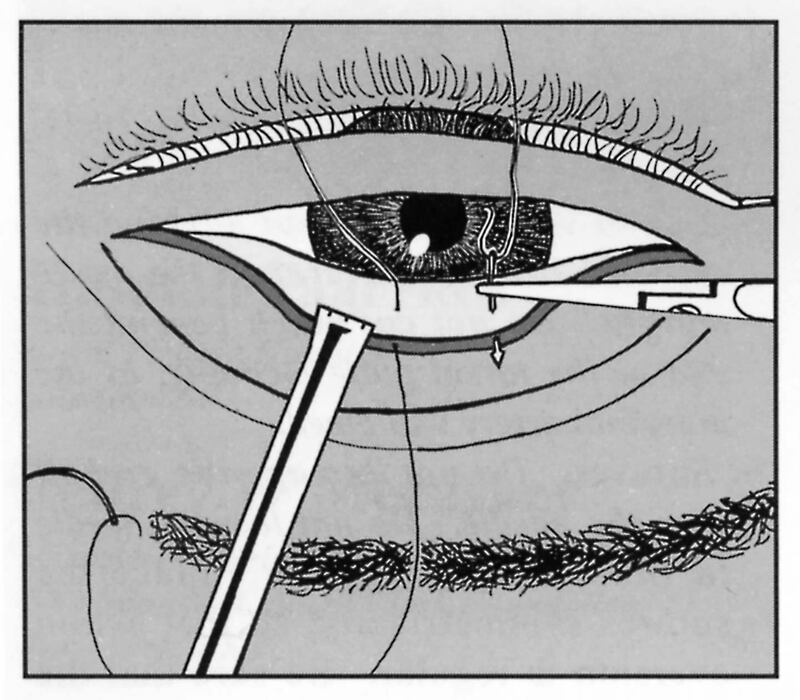 The principle of surgical management of this condition involves rotating the farginal part of the eyelid outwards, away from the globe, so that the lashes are no longer in contact with the eye. To achieve this, a horizontal lid split is made approximately 3mm from the lid margin (through tarsal conjunctiva and tarsal plate for the Trabut type operation or ‘tarsal plate rotation’ and, additionally, through orbicularis oculi muscle and skin for the bilamellar tarsal rotation). This is followed by outward rotation of the distal fragment which is effected by ‘everting’ mattress sutures. The bilamellar tarsal rotation is the procedure recommended by the World Health Organization since a randomised controlled trial showed it to be the most effective.1The WHO manual gives clearly illustrated instructions on surgical and anaesthetic techniques and management of complications.2(See also Footnote). The operation is quick and is widely performed by non-medical health workers under local anaesthetic as a day-case procedure. Patients can get back to work very quickly (a point which needs to be emphasised to them before surgery since worries about lost working time may be a significant barrier to acceptance). 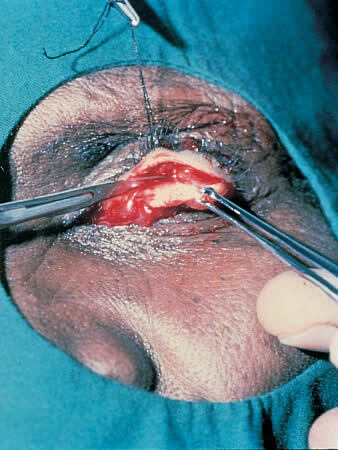 The risk of wound infection is relatively low because of the good blood supply of the eyelid and therefore surgery can be performed in patients’ own villages. The equipment needed can be carried easily by a community nurse, alone, for example, on a motorbike. Surgery is the component of the SAFE strategy which has been shown to contribute significantly to prevention of blindness.1 It also usually results in immediate and dramatic relief of discomfort for the patient. For these reasons, surgery is the first component of the SAFE strategy. It should be performed in the community, as a way into the community, and so gain support for the other elements of SAFE which may not be seen to have such an immediate and obvious benefit. In practice, however, acceptance of surgery by affected communities has been reported as low, even when surgery has been made available in the village.3 Low surgical coverage was identified as diminishing cost-effectiveness of the surgical arm of a successful trachoma control programme in Burma.4 The reasons for poor surgical uptake vary and are not well understood. One obvious factor is that the patient may not perceive the need. This is in contrast to cataract surgery which offers potential dramatic cure from blindness. Entropion surgery, to be affective (in terms of vision), needs to be performed before visual impairment and blindness occur. The World Health Organization GET 2020 Alliance has highlighted the need for further research into reasons for this poor acceptance and to investigate strategies for improving it. The long term outcome of entropion surgery (and the importance of re-exposure to C. trachomatis in contributing to recurrent trichiasis) is presently unknown, since previous studies report follow up to a maximum of 3 years.3 In practice, patients are often lost to follow up after only a week which makes monitoring of outcomes and of individual surgical performance difficult. Careful training and supervision are therefore essential, in the early stages of a control programme, not only regarding surgical technique but also in community sensitisation, anaesthetic technique (which if inadequate will affect efforts to improve community acceptance) and sterile technique. Sterile technique is particularly important in view of the rural, community environment and the HIV epidemic in Africa. Community follow up of surgical cases should be routinely done on at least a selection of patients of all surgeons, to determine if any retraining is needed. This can be incorporated into community trachoma screening and monitoring programmes. Most programmes have to operate a cost recovery system for trichiasis surgery in which the patient bears at least part of the cost. This may act as a further barrier to acceptance by a patient who is unsure of the benefit. Further research is needed into the disability and economic consequences resulting from non-compliance, or poor accessibility to surgery for trichiasis. This will provide more effective arguments for funding this component of the SAFE strategy. In the meantime, existing resources must be channelled into delivering accessible surgical services, strong community cooperation, careful surgical training and community monitoring of post-operative cases. These steps will maximise both uptake and successful outcomes of trichiasis surgery. 2 Reacher M H, Foster A , Huber J. Trichiasis Psurgery for trachoma. The bilamellar tarsal rotation procedure. WHO/PBL/93.29. 3 Oliva M S, Munoz B, Lynch M, Kocha H, West S K. Evaluation of barriers to surgical compliance in the treatment of trachoma. Int Ophthalmol 1998; 21: 235-41. 4 Evans T G, Ranson M K, Kyaw T A, Ko C K. Cost effectiveness and cost utility of preventing trachomatous visual impairment: lessons from 30 years of trachoma control in Burma. Br J Ophthalmol 1996; 80: 880-9. 5 Bog H, Yorston D, Foster A. Results of community based eyelid surgery for trichiasis due to trachoma. Br J Ophthalmol 1993; 77: 81-3.